A hot debate is unfolding in the United States right now whether the U.S. should extend an invitation to China to participate in RIMPAC, the largest multilateral naval exercise in the world. China, for the first time, participated in RIMPAC in 2014. 2016 would mark the second time that China’s participates in this significant naval exercise. The main argument against re-inviting China to RIMPAC is that Beijing should not be rewarded for its “bad behavior” in recent years, and, indeed, that China should be punished for its assertiveness – particularly in the South China Sea. This argument is based on the assumption that a non-invitation would impose real costs on China’s behavior and forcing it to stop its assertive actions. While this assumption might appear reasonable from the United States’ point of view, in reality, it is a flawed one for 3 reasons. To start with, although RIMPAC is a prestigious event that will certainly benefit China, the exercise is not ultimately something that China needs to participate in. After all, it is only a naval exercise with the overarching purpose of displaying symbolic unity in the spirit of multilateral naval cooperation. Thus, by excluding China from RIMPAC 2016, the U.S. cannot really hurt China in a meaningful way (not to mention China’s behavior in the South China Sea). If the U.S. is serious about “punishing” China, then it should focus on more tangible targets, like stopping some of the trading or investment relationships with China. Then again such sanctions are always a double-edged sword as they can hurt both parties. In that sense, all the “punishing” China mentality is understandable from an emotional perspective, but such talks are not consistent with rational decision-making. Of course, it is possible that whoever talks about “punishing” China might be principally targeting America’s domestic audience, especially as the 2016 presidential election looms on the horizon. Secondly, China’s participation in RIMPAC is a true win-win situation. Even though China’s participation in RIMPAC 2014 was a success for Beijing, it was also a success for the United States. It is reasonable for people to be skeptical about the real utility of such an event in building mutual trust between China and the U.S., but the truth is that building trust is always a long process and we must start with baby steps. RIMPAC, by all means, is one such small step. Arguably, military-to-military relations are the weakest point in an already tenuous U.S.-China relationship. It follows then that anything, no matter how small, that can improve this military-to-military relationship should be supported, not opposed. Excluding China from RIMPAC would only be counterproductive to U.S.-China relations, regardless of what the gains might be for the U.S. and its allies in Asia. Lastly, it is understandable that the United States is now frustrated with China’s increasingly seemingly assertive behavior in the South China Sea and China’s overall foreign policy in recent years. This U.S. frustration is the larger context within which we must analyze the RIMPAC 2016 invitation issue. The dilemma facing the U.S. is this: how can the U.S. maintain an effective relationship with China and continue to enjoy the benefits made possible by China’s rise without giving up its predominant position in Asia? According to some recent U.S. reports (here and here), China is determined to throw the U.S. out of Asia as it gets stronger and richer every day. This is a big myth, partly motivated by domestic interest groups in the United States. As I have argued elsewhere, China does not have the capability or intentions to push the U.S. out of Asia. It is indeed very puzzling why such a myth is so deeply rooted in the minds of many intelligent U.S. strategists. A recent paper by Chinese scholar Wang Dong also makes the same point: China is not trying to push the U.S. out of East Asia, period. Thus, a confident and secure United States should not worry about China’s participation in RIMPAC. It is not a reward for China in the first place, and it will not be a punishment for Beijing should no invitation be extended. It is merely a normal confidence and trust-building activity, made all the more necessary due to the already tenuous U.S.-China relationship. 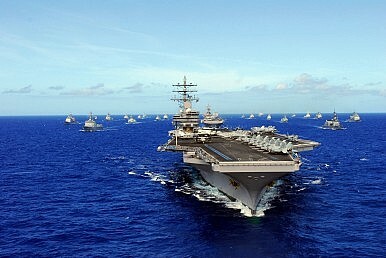 There is no need to hype the importance of RIMPAC; just let the two militaries do their jobs.